This elegant, historically true, costume consists of: Shirt, pants and waist sash. 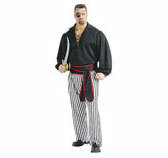 Eye patch and pirate sword sold separately. Plus size (fits 46-52 jacket size).